Shell length averages 6 – 10 in. Features a bright yellow throat and jaw. Its carapace (shell) is smooth and domed covering its body. The carapace is an oblong shape and is dark in color, but flecked with many yellow or light-colored spots and streaks. The dark head and legs often have yellow speckles. Habitat: Inhabit fresh waters and can be found in shallow lakes, sluggish streams and especially wetlands where there is ample vegetation. These turtles prefer weedy bays and marshy ponds. They are excellent swimmers and can stay submerged in water for hours. 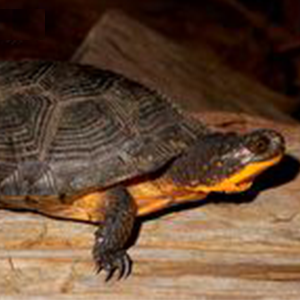 When frightened, Blanding's turtles will usually hiss and withdraw into their shells.